A BIG BAND ALBUM whose stratified multicolours and dynamics are echoed by the cover art of British painter/printmaker David Stanley, Fragment is the original work of award-winning drummer and composer Jonathan Silk. Increasingly a major presence on the Midlands’ contemporary jazz scene, following on from his graduation at Birmingham Conservatoire in 2011, the Scottish Young Jazz Musician of the Year 2014 has worked with luminaries such as Iain Ballamy, Stan Sulzmann, Liane Carroll and Soweto Kinch; and in addition to celebrated big band mentors Maria Schneider and Vince Mendoza, his drum tutors Jeff Williams and the late Tony Levin are cited as big influencers of his style. Across a full hour, Jonathan Silk’s expansive canvas is varietally layered-up by impressive forces – a big band of 19 and a string section of 13 (just look at those credits below) – with fellow drummer Andrew Bain conducting and flugelhornist Percy Pursglove in a featured role (both are respected educators at Birmingham Conservatoire). Just as unfamiliar, abstract visual art can require time to develop, meld and be understood, this impressionistic approach has taken a while to reveal an identity; yet it increasingly entices with maturity of arrangement and strong musicianship, seamlessly blending scene after scene of energised drama (Silk on the drum stool) with rivulets of subtlety. In fact, rather than offering up the usual waymarked path of favourite tracks or standout melodies, it becomes an immersive experience in which to progressively savour different illuminations of the composer’s thoughts. Softly grooving Buchaille (a beloved munro in the Scottish Highlands) luxuriates in close-knit brass and reeds, hitting high trumpet peaks before descending to quiet valleys of improvised trombone – but Silk’s way is to keenly press on as unison strings provide an almost Manhattan-style, bustling backdrop; and First Light‘s sustained serenity (recalling “a winter night spent with whiskey and friends, awaiting the snow reports at 6am”) supports Percy Pursglove’s mellow, watchful flugel, with the composer’s sensitive development fusing strings with a gently rhythmic momentum. The drummer makes his mark in wildly percussive, brassy Prelude before segueing into South African-inspired Barefeet which fascinates with unpredictable jabbing piano and acoustic guitar – an example of the unlikely hues which Silk fashions. His searching miniature, Reflection, even suggests a route into movie soundtrack, preceding In Thought‘s similarly sublime, piano- and violin-graced journey. The spiky, perilous rock-guitar adventure of title track Fragment is a winner, teeming with electric bass-driven, saxophone-rippling life as guitarist Thomas Seminar Ford’s improvisations encourage bold, brass syncopation and a full-throttle display from Silk; and he is so adept in contrasting fervour with the finely-orchestrated tranquillity to be found in Withdrawal and end piece Last Light. But it is perhaps Jonathan Silk’s broadest piece – eleven-minute Fool’s Paradise – which singly showcases his solidity and reach as a composer, the episodic variations (including inspired use of Hammond organ voice, and open spaces for extemporisation) providing a clear glimpse of a bright future. Hook up a few, memorable themes and there’ll be no stopping him! As with most recordings, it’s a privilege to revisit and enjoy these luscious soundscapes at will – but it must certainly be exhilarating to also witness this scale of ardent musicality in a live setting. Good news, then, that 2017 tour dates are to be announced. Released on Stoney Lane Records, Fragment is available as CD or digital download from Bandcamp. WHO WOULD IMAGINE that quite such a breadth of engaging, meaningful jazz creativity might be realised inside 32 minutes? Remarkably, in his writing for 12-piece ensemble, the pianist appears to ingest and then musically express the varietal sounds of the city, not unlike the way Messaien interpreted birdsong; and there are also hints of Ravel’s jazz inflections. It can all be found in opening number A Real Bombshell, whose skittering, shunting impressions might well reflect the chaos of a Paris rush hour. With string quartet at its heart, it has an attractive big band dynamism, offering a fantastic weave of brass and reed textures (reminiscent of Mark Lockheart’s evergreen Ellington in Anticipation) as Percy Pursglove’s shrill trumpet rises out of the clamour. Ode to the Trees evokes a moonlit woodland exploration, its quietly bluesy piano groove prompting an almost alarming crescendo of hoots, chatters and squawks from an ensemble heading towards the stature of Count Basie (with frissons of Carla Bley). Bookended by the quirkiness of two miniatures, Happy Plants I & II (first, the strings’ playful pizzicato, and then an intriguing New Orleans/calypso hybrid), Hasha’s Theme seems to draw on Gershwin and Ellington – and the maturity of Pringle’s arrangement brings out both lush and jarring major/minor horns, fronted by Chris Young’s fabulously nonchalant alto. The Writer (Hemingway perhaps) is mischievous, its tentative first steps emphasising how well the strings and woodwind integrate; and both this and following track Through the Grate further reveal Mark Pringle’s knack of slowly unfolding a dramatic, trembling landscape with flecks and fizzes of orchestral colour, as well as sudden changes of tempi and dynamics (neither recommended for an iPod playlist along a dark country track!). And the final snippet, a windband-like And That’s OK, settles the equilibrium…… or does it? Here is a recording which, in terms of composition, improvisation and overall musicianship, is exquisitely formed; yet it also alludes to many greater heights yet to be conquered. 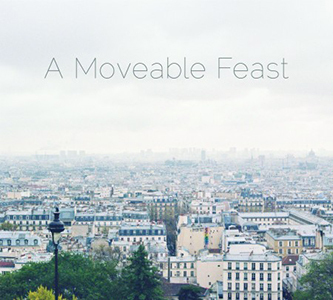 Released on Stoney Lane Records on 18 September 2015, A Moveable Feast is available at Bandcamp and also at iTunes.